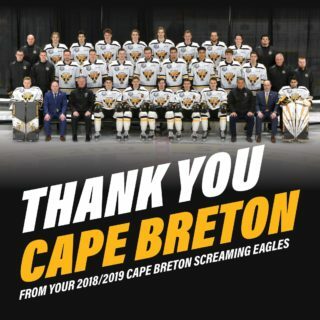 The Cape Breton Screaming Eagles controlled the action on Saturday night from wire to wire in a 6-0 romp over the Val-d’Or Foreurs. The win was the third in three games for the Eagles on this week’s homestand. The Eagles had to overcome a slow start to the action for both sides. There were no shots on goal for the opening ten minutes of the game. In part it was due to a tentative cautious opening but both sides did well to take away space in front of the goal. Félix Boivin and William Provost were the first to register shots, for Val-d’Or, at the 10:55 mark. William Grimard turned aside both opportunities and play went the other way. The Eagles were able to score on their first series of chances as Shaun Miller put home a rebound at the 11:26 mark. Just over four minutes later, a sequence of seven consecutive passes and sustained Eagles pressure led to Adam McCormick scoring on a rebound of his own to make it 2-0. Between the two goals, there was a spirited scrap between Cape Breton’s Wilson Forest and Val-d’Or’s Emil Lessard-Aydin. Forest landed a majority of the blows but would be ejected from the game as it was ruled he removed Lessard-Aydin’s helmet. Ian Smallwood, who began playing on the night as a forward, would play defense for the balance of the game in Forest’s absence. The fighting penalties to Forest and Lessard-Aydin were the only penalties called in the first half of the game. Before either team earned a power play, the Eagles would double their lead- with the same scorers as in the opening period. 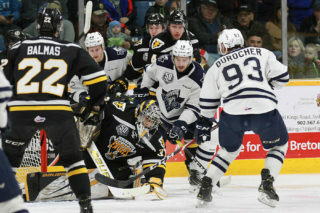 McCormick’s second goal came at the three minute mark, as he cut through the Val-d’Or defense before slapping the puck past Mathieu Marquis. At 8:35 Miller would lift a backhand over the Foreurs netminder. The first power play would go to Val-d”Or, and it would be a big opportunity to get back into the game as Antoine Crête-Belzile was whistled for hooking, and Kyle Havlena was given two minutes for interference. But the visitors were not able to score during the 1:22 long 5 on 3, and the Eagles held the shutout heading into the third period. 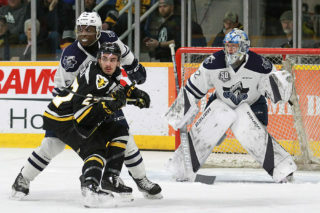 Cape Breton was also able to further add to the lead, as in the final five minutes Noah Laaouan blasted a one timer past Marquis. The Screaming Eagles did not have any power play opportunities in the opening 40 minutes but would earn five man advantages in the final stanza. Late in the game, with Félix Boivin serving the first half of a double minor, Mitchell Balmas would blast a shot from the top of the left faceoff circle to make it a 6-0 final. William Grimard stopped all 14 Foreurs shots to record his first career shutout. Marquis allowed six goals on 30 shots. Screaming Eagles captain Declan Smith missed the game due to the passing of his mother Rachel, who had been battling cancer. A moment of silence was observed prior to the game. The Screaming Eagles would like to offer condolences to Declan and his family during this extremely difficult time. 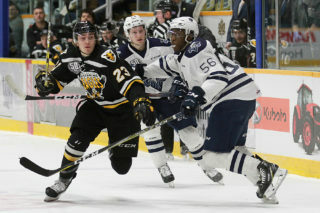 The Screaming Eagles now head to Moncton for a one game road trip and a date Wednesday night with the Wildcats at 7 PM. You can catch all the action beginning with the pre-game show with Patrick McNeil at 6:30 on 1270 AM CJCB or online at www.cjcbradio.com.